The CIPR artificial intelligence (AI) panel has published an initial list of tools collated from its crowdsourced project. You’ll almost certainly discover something to help you work smarter. It’s three weeks since the CIPR announced a new panel to explore the impact of artificial intelligence on public relations. We’ve adopted the hashtag and moniker #AIinPR. Our first project is a crowdsourced initiative to create a database of tools. It has its genesis in the #PRstack project from 2014 and 2015. The open source project has received more than 100 submissions. We’re publishing the first list of 95 tools across more than 20 categories. Inevitably there have been duplicates. The list includes tools to help you work smarter and more efficiently. I’ve discovered at least half a dozen new ones. We hope to publish a final database by the end of April. Our second project is an assessment of the impact of technology on practice today and in the future based on the Global Alliance Competency Framework. My thanks to Jean Valin for leading this project. Temporary and disposable email service. Useful for signing up for internet services and testing. Artificial intelligence (AI) has become a catch all term to describe technology that engages with people or displays human characteristics. It is contributing to hype and uncertainty around the topic. AI is a sophisticated application of technology whereby a computer demonstrates human cognitive functions such as learning and problem solving. As such only a handful of the tools outlined in this article utilise AI but the growing level of sophistication is clear. The Wikipedia community has established a project to build a glossary that describes artificial intelligence. 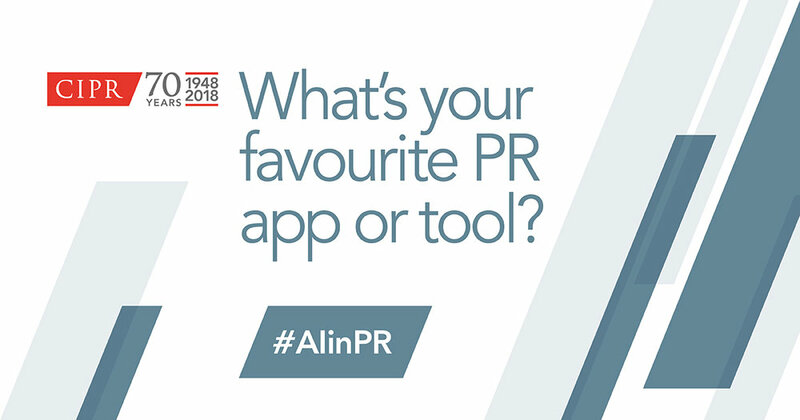 The CIPR #AIinPR panel was founded in February 2018 to explore the impact of technology including artificial intelligence on public relations and the wider business community. We're aiming to tackle three projects in 2018. The crowdsourcing exercise described in this article aims to characterise technology and tools that are helping public relations practitioners work smarter and more efficiently. As part of this project we'll aim to develop a definition of AI as it applies to the range of technology in public relations. A skills framework will seek to estimate the likely impact of artificial intelligence on the public relations workforce. This will map the tools identified in the crowdsourcing exercise against the CIPR State of Profession survey. A literature and content review will explore the impact of artificial intelligence on the public sphere. We'll produce a discussion paper for practitioners. Thanks to everyone who has made submission to the crowdsourcing project so far: Sarah Ion; Richard Howat; Roberto Napolitano; Iliyana Stareva; Anthony Olabode Ayodele; Hagen Gerle; Rayna de Lange; Deb Sharratt; Sara Collinge ; Merve Uluser; Raf Weverbergh; Rob Ashwell; Florian Hohenauer; Shak Rafiq; Matt Ferris; Yudha Ikhsan; Hayley James; Abha Thakor; Jonathan Bean; Lizzie Owen; Everett Martin; Robert Masters; Christine Townsend; Kate Strawson; Jose Bonito; Salvador da Cunha; Olivia Collins; Chris Knoblock; and Ged Carroll. Thanks also to the CIPR #AIinPR panel for its work on this project: Chris Dolan; Kerry Sheehan; Alastair McCapra; Matt Silver; Sharon O’Dea; Andrew Smith; Maria Loupa; Anne Gregory; Jean Valin; Ben Verinder; and Jon White.